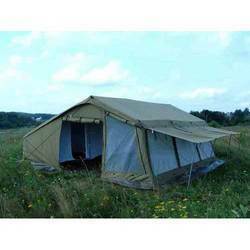 Owing to the latest manufacturing facilities, we are able to offer Camping Tents. These are developed by a creative team of personnel using qualitative fabrics. The offered tents have the accommodation facility of 3-4 peoples easily. To meet the clients' requirements, we offer these tents in various sizes and dimensions. 2. Made up of 100% Cotton 320 GSM quality canvas. 3. Available in Many sizes.